Remember that every dog is different. As a general guide we advise offering the daily amount of food recommended for the ideal bodyweight of your dog in the feeding guide on the pack. In the below guide you’ll find the recommended daily calories for your dog, as well as feeding guidelines based on a diet of Pedigree®. 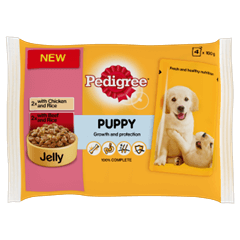 If you are feeding a different brand, please consult the calorie information on-pack and adjust the amount of food accordingly to meet your dog’s recommended daily calories. To halve the daily amount of food if you are feeding two meals a day. The Waltham™ Centre for Pet Nutrition recommends feeding a mixed diet where 50% of calories come from wet food and 50% from dry food. The guidelines are based on all of your dog’s recommended daily calories coming from 100% complete Dry or wet food. Please adjust accordingly if you are going to feed any oral care products or treats. Please ensure that any ‘non-complete’ treats or food you are feeding your dog accounts for less than 10% of your dog’s daily calories. The body size of dogs can range from 1 to 100kg, which is a greater range than any other species. There are different nutritional needs and specific health concerns linked to the size of dog. Larger dogs have a shorter life expectancy than small ones and reach senior status at a much earlier age. Therefore, larger breeds and giant breeds will benefit from a change to a Pedigree® Senior diet at an earlier age. This timeline provides an understanding of the life stages of different size dogs. Check out our dry and wet dog food products here.